Fast, sleek and stable: An Etchells is a powerful, 30.5′ keelboat that bites into big breeze and digests it gracefully. The long lines and narrow beam of an Etchells make her visually stunning as she moves across both flat waters and ocean chop. And with a 22′ waterline and relatively little wetted surface area, the Etchells is also able to get good boat speed in light-air conditions. The boat is very sensitive to fine adjustments in the rig and sail trim, which makes it technically intriguing to all types of sailors. The Etchells was designed in 1966 by Elwood Widmer “Skip” Etchells (1911-1998), a boatbuilder and naval architect from Old Greenwich, Connecticut. The IYRU’s search for a new three-man Olympic-class keelboat was Skip’s inspiration for the Etchells design. Having worked for renowned classic boat builders Sparkman & Stephens early in his career, Skip had developed an aesthetic sensibility that he combined with his natural prowess for building fast one-design craft. The result was the only boat Skip ever designed, the Etchells. 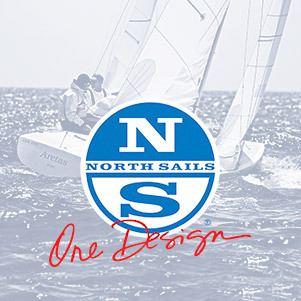 While the Etchells was ultimately trumped by the Soling as the next Olympic class amid international politics, the boat was warmly received as a new one-design racing class. The Etchells attracted the attention of Long Island Sound locals who embraced the speed, seaworthiness and intensity of the boat by founding Fleet 1 in 1968. Today there are more than 50 fleets worldwide sailing almost 1400 Etchells. Sail area: 310 sq. ft.